Made out of wet suit quality neoprene - provides optimum all around cushioning. Special two-finger loops offer maximum comfort and finger flexibility. Non-slip palm pad provides optimum grip and palm cushioning. Hook & Loop (like Velcro) fastener wrist closure for easy on and off. Our Cross-Training Workout Gloves are ideal for all around training and are uniquely designed to take on and off easily. These fitness gloves are ideal as weight lifting gloves, golf gloves, or anything else you might be doing that requires slip-free grip. One size fits all. Velcro closure allows for width adjustment. Our Cross-Training Workout Gloves are ideal for all around training and are uniquely designed to take on and off easily. No other glove compares! These fitness gloves are ideal as weight lifting gloves, golf gloves, or anything else you might be doing that requires slip-free grip. 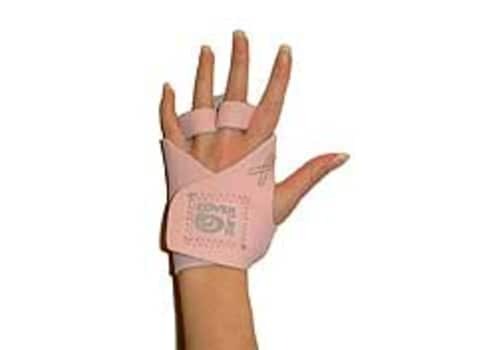 Special two-finger loops offer maximum comfort and finger flexibility. Non-slip palm pad provides optimum grip and palm cushioning. Hook & Loop (like Velcro) fastener wrist closure for easy on and off. Wash by hand. Hang to dry. Our weight lifting gloves have been featured in Muscle & Fitness Hers Magazine, Energy for Women, Oxygen and several other local, regional and national publications!